The SpaceX CEO is now aiming to send humans to the red planet by 2024. 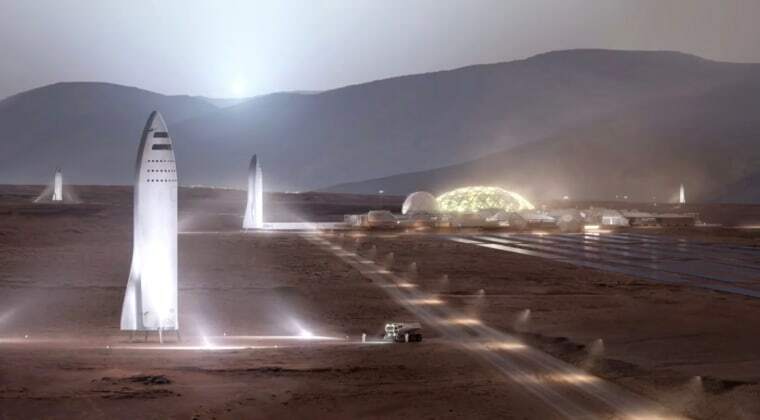 Those are just two of the highlights of the company's current Mars-colonization plan, which SpaceX founder and CEO Elon Musk unveiled early Friday morning EDT (Sept. 29) at the 68th International Astronautical Congress (IAC) in Adelaide, Australia. The new plan retains this same basic idea, but with some important tweaks. For example, the rocket has been scaled back a bit; it will now be about 30 feet (9 wide) and sport "just" 31 Raptor engines. (For comparison, the first stage of SpaceX's in-service Falcon 9 rocket has nine Merlin engines.) And the name "ITS" seems to be out: During Friday's talk, Musk repeatedly referred to the system by the "code name" BFR, which is short for Big F***ing Rocket. But the most important change has to do with the system's affordability, Musk said Friday. "In last year's presentation, we were really searching for what the right way — how do we pay for this thing?" he said. "We went through various ideas — do a Kickstarter, collecting underpants. These didn't pan out. But now we think we've got a way to do it." The answer, he explained, lies in downsizing the system a bit and using it for everything that SpaceX does, from satellite launches to International Space Station resupply flights to crewed Mars missions. In other words, the company plans to put its Falcon 9 and Falcon Heavy rockets — the latter of which hasn't even flown yet — and its Dragon capsule out to pasture relatively soon. "If we can do that, then all the resources that are used for Falcon 9, Heavy and Dragon can be applied to this system. That's really fundamental," Musk said. "We believe that we can do this with the revenue we receive for launching satellites and for servicing the space station." SpaceX will, however, "build ahead" and keep a stock of Falcon 9s and Dragons around for a while, in case customers wish to use those vehicles during the early days of BFR operation, Musk added. The BFR booster will be capable of lofting 150 tons to low Earth orbit (LEO), making it more powerful than NASA's famous Saturn V moon rocket, which could launch 135 tons to LEO, Musk said. "If you can get to a very high reliability with even a single engine, and then you can land with either of two engines, I think we can get to a landing reliability that is on par with the safest commercial airliners," he said. "So you can essentially count on the landing." "It's really crazy that we build these sophisticated rockets and then crash them every time we fly. This is mad," Musk said. "I can't emphasize [enough] how profound this is, and how important reusability is." SpaceX is now beginning "serious development" of the BFR system, he added. The company aims to launch at least two uncrewed ships to Mars in 2022, primarily to confirm the existence of necessary resources and set up infrastructure for future missions — power, mining and life support systems, for example. "It's 2017; we should have a lunar base by now," he said. "What the hell is going on?" "Most of what people consider to be long-distance trips would be completed in less than half an hour," Musk said.